Looking for the best cheap gaming PCs can be a bewildering process. If you don’t know what you’re looking for, then you may end up sinking funds into a machine that doesn’t perform as needed. Either way, you’ll want decent hardware for the bucks you’re shelling out, especially now that virtual reality is becoming more mainstream, thanks to Microsoft’s Windows Mixed Reality platform baked into Windows 10. All models below can support the HTC Vive and Oculus Rift headsets for VR, one of our requirements when determining the best cheap gaming PCs you can buy. Below you will find a list of desktops focused on gaming that we believe are great for the money, with options for the latest-generations of Intel and AMD hardware. Do note that we would expect new mid-range and entry-level graphics cards from Nvidia and AMD to release towards the end of 2018, or early 2019, so if you aren’t desperate to make a purchase now, waiting a few more months may provide better options. Building off of our love of the previous generation Inspiron 5675, the 5680 updates the hardware of its predecessor and offers the same, understated design with great overall value. The new Inspiron starts at just $600 and comes outfitted with either AMD or Intel/Nvidia hardware. Options include first and second-generation AMD Ryzen CPUs and a choice of RX 570 or 580 graphics cards. Alternatively, you can choose from an eighth-generation Core i3 CPU with a GTX 1050, all the way up to an i7 with a GTX 1060. In either case storage can go up to a terabyte and up to 32GB of memory. 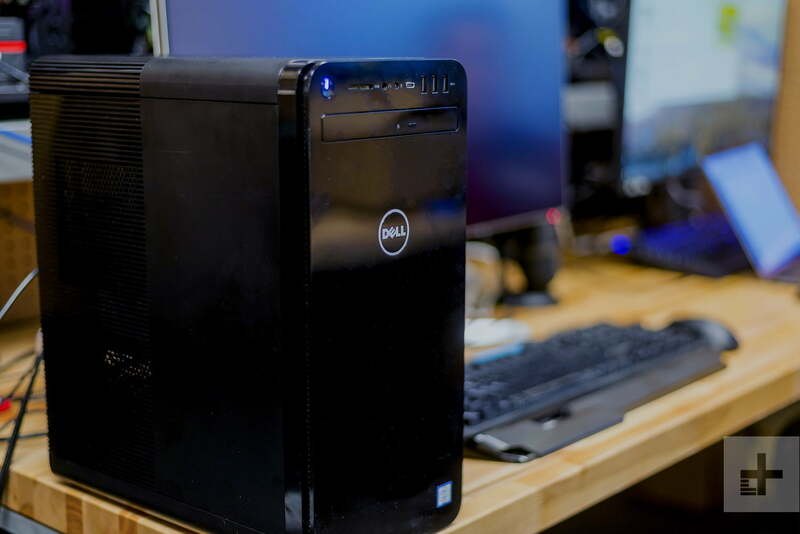 Despite the updated hardware, the Inspiron 5680 retains the same clean, professional look of its predecessor and doesn’t scream ‘gamer’ like some of the other builds on this list. It’s not the easiest of systems to upgrade because of its tightly held together components — to ward off damage during shipping — but a solid entry-level gaming desktop like this could be your best upgrade path. 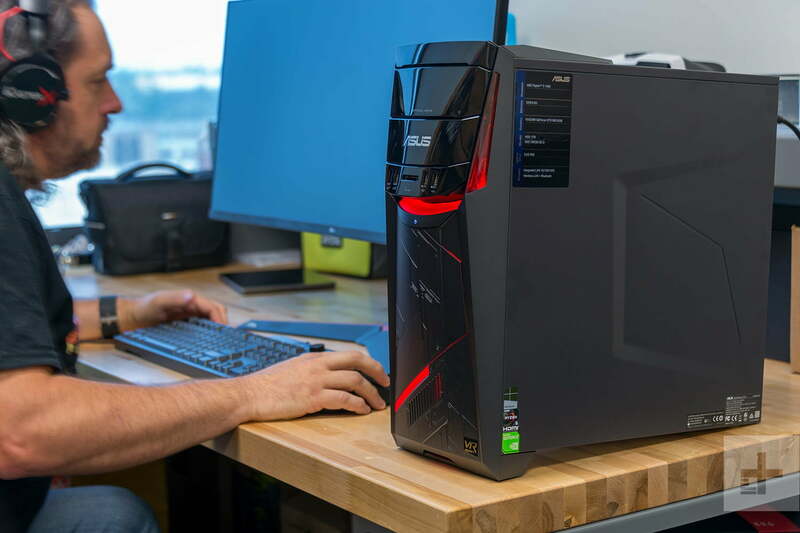 If you’re a little tired of Intel hardware and want to give the red team a try, Asus’ G11DF features a first-generation AMD Ryzen 5 1400 processor, an Nvidia GTX 1060 graphics card, and 8GB of RAM. It’s close in power to the above Dell system, but with a flashier exterior and an AMD chip purring away under the hood. Although the higher-specced versions do edge over $1,000 at some retailers, in our benchmarks, the Asus G11DF was a capable performer, easily maintaining an average of 73 FPS in For Honor at max detail settings and 1080p. That’s the real caveat here, these desktops are all powerful enough to run recent games at high or max detail settings, as long as you keep the resolution at 1080p. These systems aren’t really designed to step into 1440p or 4K. If you’ve ever played a role-playing game, you’re probably familiar with the concept of min-maxing. Bringing some stats down to their bare minimums, and maxing out others to keep your character’s build lean and optimized. That’s exactly what Dell did with the XPS 8930. It features an 8th-generation Intel Core i3 processor, offering just enough CPU horsepower to get some everyday work done, alongside an Nvidia GeForce GTX 1060 graphics card with 6GB of RAM, effectively maxing out its graphical power without breaking the bank. In a small black chassis, it’s not exactly the most eye-catching gaming rig out there, but it offers an excellent balance of price and performance, and there are cheaper options if you don’t need all the kit. During our benchmarks, the GTX 1060 kept up with much more expensive machines without breaking a sweat — and remember it features the big version of the GTX 1060 with 6GB of RAM, not the smaller 3GB version you’ll find in most budget gaming rigs. Lenovo’s Legion Y520 is a supremely affordable but powerful gaming PC, ticking almost all of the boxes for what we want to see in a build at this price point. Its base model is just $700 at the time of writing and offers an Intel Core i5-8400 CPU, with 8GB of RAM, and a GTX 1050 Ti graphics card for smooth 1080P gaming. The only thing really missing is an SSD, as this model comes with just a 1TB hard drive. However, alternative configurations come with either 16GB of Optane Memory, or a 128GB PCIe SSD. There are also options for more powerful CPUs up to a Core i7-8700, and a heftier graphics card in the form of a GTX 1060 3GB. This isn’t a system that’s going to handle ultra-settings or 4K resolution, but that’s not what it’s designed for. It looks good, has good, if not great, components, and some decent upgrade options if you want them. It’s a solid budget gaming build. MSI’s streamlined desktop is ready and willing to handle the Oculus Rift and HTC Vive. Powering this affordable beast is eighth-generation Intel Core i5-8400 processor, and Nvidia’s GeForce GTX 1060 (3GB) graphics card. They’re crammed into an impressive design that resembles a gaming console, which is built to rest on a surface horizontally, or vertically, using the provided seat/stand. Other ingredients inside MSI’s desktop are 8GB of DDR4 system memory clocked at a meager 2,133MHz, and a 1TB hard drive, with options for SSDs if you’re willing to spend a little more. All of this is complemented by Audio Boost 3 and Nahimic 2 audio, MSI’s Mystic Light illumination technology, Wi-Fi and Bluetooth connectivity, and plenty of ports to support VR headsets. So how big is this console-style PC? 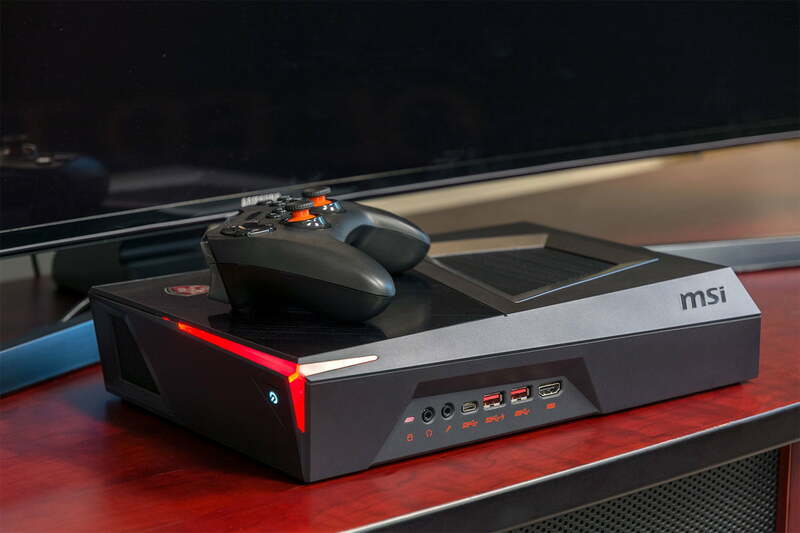 It weighs a mere 18.1 pounds, and measures 15 x 10 x 20 inches, which is a bit larger than the original Xbox One console.